I’ve been glued to MSNBC since January 21. It hasn’t been good for me. I need a break. It’s time for me to post more recipes! I’m starting with this BBQ sauce because I bought some country ribs on sale this morning, and oven BBQ’d ribs for dinner sound like a great idea on this rainy February day. The original recipe for this BBQ sauce was from a newspaper column in the San Jose Mercury News in 2013, I modified it just a bit (bourbon!) 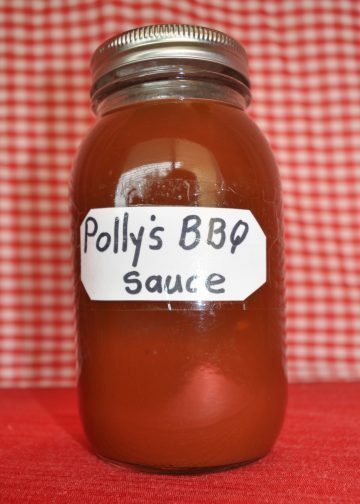 and four years later it’s still my go-to BBQ sauce. You can dress this recipe up to suit yourself. You’ll probably want more hot sauce, maybe some liquid smoke…you might even want to use beer or red wine in place of some of the coffee–but make the original first, then decide how you want to make it yours. If it’s a rainy day where you are, and you are lucky enough to get country ribs on sale too, soak the ribs in BBQ sauce, and place the ribs in a large shallow pan. Cover with BBQ sauce. Cover the pan with foil. Bake at 400 degrees for approx. 1 1/2 hours. Combine all ingredients in a saucepan. Bring to a boil over medium heat. Lower heat. Simmer for about 20 minutes, stirring occasionally. Use immediately or refrigerate for up to a week. Makes 4 cups BBQ sauce. What is Triple Threat Chicken? Chicken breasts that have been 1) marinated, 2) grilled and 3) glazed! Delicious! I have been making this chicken for about five years now, and it has always been well received. I served it last week at the Grand Opening of my Little Free Library(more about that later*), and one of my friends said, “If you post the recipe for this chicken, I’ll be tempted to start grilling again”. Here it is! Fire up the grill. One of the advantages of this recipe is that you probably have all the ingredients for the marinade and the glaze on hand. Well, all the ingredients except one, do you have Raspberry Vinegar on hand? If you don’t, substitute Red Wine Vinegar, but if you buy Red Raspberry Vinegar on your next trip to the grocery store, you will have some on hand for the next year or two (vinegar doesn’t go off)! The disadvantage of this recipe is that you have to make two sauces, one for the marinade and one for the grilling, so it’s a few extra minutes measuring and pouring in the kitchen. Just make both sauces at the same time, because some ingredients are in both sauces. I use boneless, skinless chicken breasts, but boneless, skinless thighs can be used just as easily if you prefer darker meat (any chicken parts can be used in this recipe, the boneless, skinless ones are just easier to grill). I cut-up the chicken breasts, and cook the same pieces at the same time to ensure even cooking. Don’t even think of cooking a whole breast, it’s too difficult, because the breast varies so much in thickness. First, I cut the tenderloin off; then I cut off the lower triangle of the breast; when I have just the thickest part of the breast left, I cut that in half. I get four pieces of chicken from one breast. The tenderloins and the triangle pieces are thin and cook the most quickly. The thick pieces from the top of the breast take much longer to cook so put them on the grill first and the tenderloins on last. 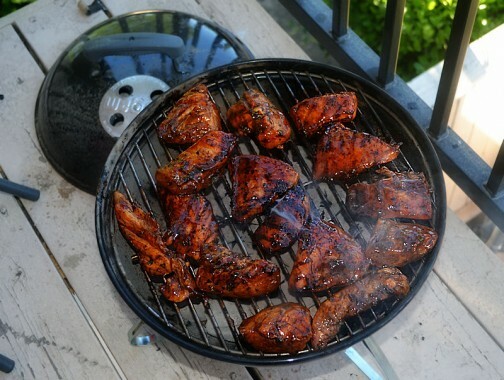 Now here’s the most important tip for grilling the chicken: half cook the marinated chicken on the grill, then take it off the grill and dunk into a pan with the glaze, then return the chicken to the grill to finish off. This enables the chicken to cook before the glaze burns! Novices will use a brush and brush the glaze on the half cooked chicken. Silly novices. Brushing does not get enough glaze on the chicken, and a lot of the glaze drips onto the coals, which causes flare ups, which causes hot hands and more burned spots than necessary. But before grilling, you have to marinate, and that part is easy. The chicken needs to sit in the marinade for 2-4 hours, so start early in the afternoon. Remember to start your coals approx 40 minutes before you want to start grilling. Grilling the thickest parts of the chicken might take 20 minutes, the thinner tenderloins might take only 5 minutes. All of these times are approximate, and all depend on how hot your fire is. Use common sense. Don’t freak out. The chicken would cook at different times in a pan on the stove, too. Just keep your eye on each piece of chicken, judging it as an individual, and you’ll be fine. The picture above was taken on the tiny balcony of my daughter’s apartment, the first time she made this chicken, and only the third time she had ever BBQ’d. Doesn’t it look great? Don’t forget to have s’mores for dessert, you don’t want to waste all those lovely coals! For sides, we like to grill sliced zucchini and tomatoes fresh from the garden, but corn-on-the-cob, potato or pasta salad, baked beans, and garlic bread are also classic accompaniments. Leftovers are great on a green salad the next day, or diced in a quesadilla or burrito, or added to stir-fried veggies and served over rice. Desired number of boneless, skinless, chicken breasts each cut into 3 pieces (see note above). One recipe of marinade will do for 6-8 breasts. For more chicken, just double the marinade. You’ll have enough glaze for a double batch. Place your chicken chunks into a large Ziploc bag or marinating tray. In a small measuring cup or bowl, combine all ingredients for marinade. Pour the marinade over the chicken. Refrigerate, and marinate chicken for 2 to 4 hours. Remove from refrigerator one hour before grilling so the chicken can be at room temperature before putting on grill. While chicken is marinating, prepare the glaze. Combine all ingredients and place in a bowl or container (the container should be big enough to hold chunks of half cooked chicken and be able to withstand the heat of half cooked chicken. I use a large flat Tupperware container), stir well to combine. Drain the room temperature chicken from the marinade. Grill. Pick out similar size pieces of chicken and put them next to each other on the grill. Put the thickest pieces on first, then the tenderloins, then those thin triangular pieces. Turn as needed. When the pieces are one-half to two-thirds cooked, remove from grill and dunk completely into the prepared glaze, turning to get a good coat. Return the chicken pieces to the grill for an additional 2-3 minutes on each side. The glaze will caramelize and look completely yummy. Allow the chicken to get grill marks, but remove from heat before charring!! Remove chicken to a serving platter, and dig in! NEWS FLASH! 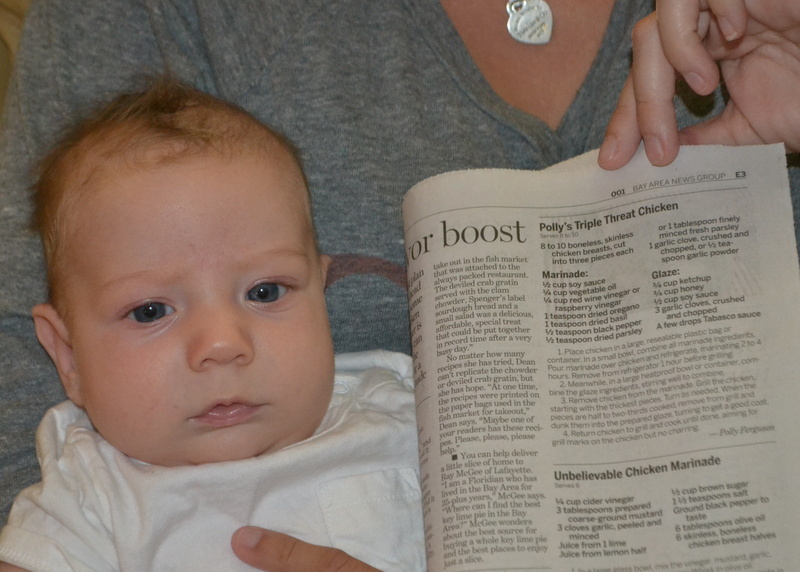 Look what was in the San Jose Mercury News today, August 1, 2013. The cutie patootie is my 2 month old grandson, awwwwww. Want a new, different and totally tasty burger to add to your repertoire? Here it is! A Turkey burger with a Spanakopita Flair. This recipe was inspired by Rachael Ray’s, Spanakopita Burger from her book, 365: No Repeats. I made her recipe “as is” last year, and it was good, but this year I made it my way (below), and loved it. I grill these burgers, but pan frying works, too. I am sure some cucumber raita would go well on these burgers but we ate them the traditional American way, on a good bun with sliced homegrown tomatoes, a bit of crunchy lettuce and ketchup. Make the patties as big or as little as you want. I made 8 patties, approx 6 oz. each, but I love those little slider buns that are available now and think hosting a BBQ and serving a variety of burgers would be fun. You could make slider sized regular hamburgers, these Greek Turkey Burgers, and maybe a Salmon burger. Don’t forget the sides of watermelon, corn, and a pasta salad, and grill some of that zucchini that I know is taking over your garden. S’mores for dessert, of course. How about my Peach Iced Tea or Blueberry Lemonade to drink? Done! Send out the e-vite! My son’s girlfriend just took a bite of my his leftover and warmed up Turkey burger. Her exact words were, “WOW. That’s fantastic!” Yup 🙂 And she scored big points with the boyfriend’s mama! To serve: Buns, and choice of toppings. Place the ground turkey in a large bowl. Remove the defrosted spinach from the box and squeeze, and I do mean s-q-u-e-e-z-e ALL the water from the spinach. I did not say drain, I said squeeze. Take about 1/3 of the spinach into your hand and squeeze, squeeze, squeeze until totally dry. Repeat until all the spinach is in little tight balls. Fluff the balls up and add to the ground turkey in the bowl. Add to the turkey mixture the feta, olives, red onion, garlic, oregano, basil or parsley, salt and pepper, applesauce or grated apple, and the bread crumbs. With a fork lightly mix the ingredients until everything has been uniformly distributed. Divide the mixture into 8 equal parts. Pat each part into a flat patty, just slightly bigger than your hamburger buns. Grill, or pan fry until done, about 3 minutes on each side, but this all depends on how hot the grill/pan is. 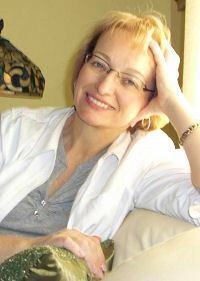 Last week I received an email, “Top Ten Recipes of June 2011”. This email came from Taste of Home magazine. I am not a huge fan of Taste of Home, too many of their recipes start out with a mix, but I am a sucker for Top Ten lists. So I opened the email. The picture of the Grilled Vegetable Platter looked good, the recipe had five stars out of five stars with twelve reviews, so I clicked away. The recipe sounded good and looked simple enough, so I tested it…, winner, Winner, WINNER! Don’t feel like you have to stick to the veggie combo listed. Grill what you have and what you like. I left out all the bell peppers. I. don’t. like. bell. peppers. I didn’t add in any mushrooms because I just posted that fabulous recipe for Grilled Portobellos. Taste of Home reviewers also reported adding green beans, snow peas, sweet potato rounds, and halved cherry tomatoes into the mix. My change to the Taste of Home recipe is to make two marinade mixtures. Use one to marinate the veggies in prior to grilling (and then discard that marinade with the Ziploc bag), and then use the second one to drizzle over the veggies after grilling, the second marinade is just slightly different from the first. I also substituted freshly minced garlic for the garlic powder in the first marinade. Now for my number one tip on grilled veggies… Grill the veggies first, before the meat or the fish. Veggies are grill hogs, taking up an entire grill, and some of them take a surprisingly long time to grill, onions especially. The asparagus will cook most quickly, then the squash, then the carrots, and the onion will probably still be cooking when you start in on the meat. Just remove each veggie when done and, when your veggie platter is mostly complete, drizzle with the second marinade, and place the whole platter in a warm oven. Another reason for cooking the veggies first? You can be in the middle of cooking them when your guests arrive, and I haven’t met a guest yet who is not impressed by a grill covered in marinated mixed veggies, some with nice char marks! Combine the olive oil, honey, Balsamic vinegar, oregano and minced garlic or garlic powder for the marinade. Pour into a large resealable plastic bag; add the vegetables. Seal bag and turn to coat; refrigerate for 1-1/2 hours. Combine the ingredients for the drizzle; cover and set aside. Place vegetables on a grilling grid (I don’t do this…I place the veggies directly on the grill, and loose a fair number of asparagus spears, skinny carrots and zucchini). Grill, covered, over medium heat for 4-6 minutes (adjust for each veggie) on each side or until crisp-tender. Note: The onion wedges will probably fall apart. That’s OK. Just grill the slices (the slices that don’t fall through the grill, that is). As soon as each slice is nicely brown and feels soft, transfer to platter and drizzle with some of the second marinade mixture. Transfer to a large serving platter. Drizzle with the second “marinade” mixture. So now you know what you will be grilling, what should you have for dessert? S’mores (or S’mores Bars? ), Frozen Bananas (always fun), or my personal favorites, Fresh Blueberry Pie or a Mixed Berry Pie?? Have some fun and search my recipes! Outdoor grilling rocks! Hope you are enjoying both cooking and dining outside. Next up, grilled artichokes! Thanks for stopping by my kitchen again today. I love it when you pop in! Most unfortunately, I don’t have that particular Helix High School 30th Reunion recipe for mushrooms, but I have finally found a recipe and method that seems to come pretty darn close. For this I have to thank Cook’s Illustrated, which was a starting point for this recipe. I adjusted their method just a bit to ensure some nice grill marks on the Portobello slices, and to make it a bit more convenient to prep ahead of time. The original recipe is from the 2010 “Summer Grilling” publication (page 61). These Portobellos are marinated, grilled, sliced, grilled a second time, marinated a second time, and served. Yes, another recipe that is a bit of a bother, but the steps are easy, and can be done ahead of time, and the final step can be done while the guests stand around ohhh-ing and ahh-ing and wishing they knew how to make such marvelous mushrooms. You’ll feel so accomplished. Trust me on this. Combine all ingredients for first marinade in a large Ziploc bag. Add cleaned mushrooms, seal bag, and toss gently. Let mushrooms stand at room temperature for about one hour in this marinade. Cut four 12-inch pieces of foil. Remove mushrooms from marinade. Place one mushroom, gill side up, on each square of foil. Fold foil edges over mushroom and seal securely. Grill mushrooms in foil packed, gill side/sealed foil side UP, until mushroom is tender and juicy, about 10 to 12 minutes. Set aside to cool. Carefully open foil packets. Remove mushrooms and slice, on the diagonal, into long thick slices. Combine all the ingredients for the second marinade in a large bowl and set aside. 20 minutes before dinner, return sliced mushrooms to grill. Grill each slice until nicely grill marked. Depending on the heat of your grill this could take anywhere from 1-3 minutes on each side. Place grilled mushroom slices in bowl with marinade and toss to coat. Cover bowl with plastic wrap and let mushrooms marinate for 15 minutes (and up to 30 minutes). Remove mushrooms from marinade and place on serving platter. Enjoy! P.S. 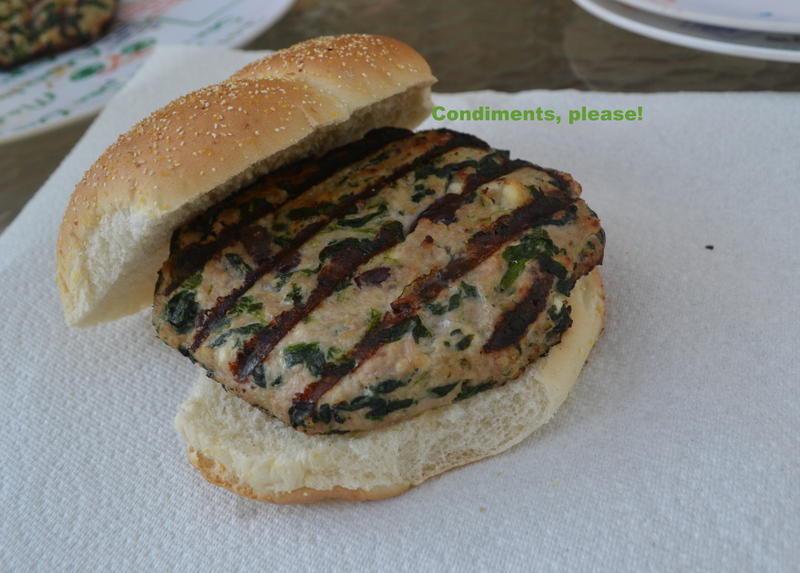 This grilled recipe is being added to the summer grilling link party at Family Fresh Cooking! Let’s get Grillin’ with Family Fresh Cooking and Cookin’ Canuck, sponsored by Ile de France Cheese, Rösle, Emile Henry, ManPans and Rouxbe!